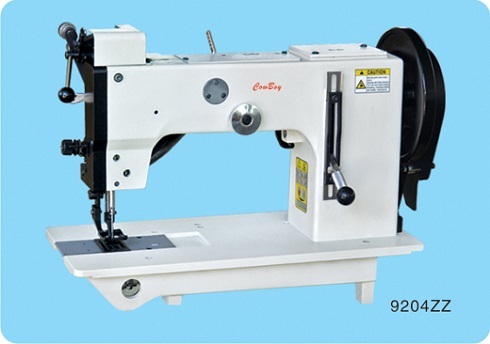 This industrial sewing machine is designed for joining two piece of carpet/mats/rugs together by stitching (different from HR-4A and HR-4B for overedging carpets). Extreme wide zigzag width (16mm) allows to join carpets with wide border (stonger seam); Powerful walking foot mechanism insures the smooth feeding of carpet (even for elastic carpet ); Extra large shuttle hook and bobbin capacity offer high efficiency. Applications: joining two pieces of carpets, mats and rugs together by zigzag stitch or overedging thick carpets, mats, wool blankets, cotton rugs, braided rugs, isolation blanket.